I know. The name alone is enough to give you a heart attack. 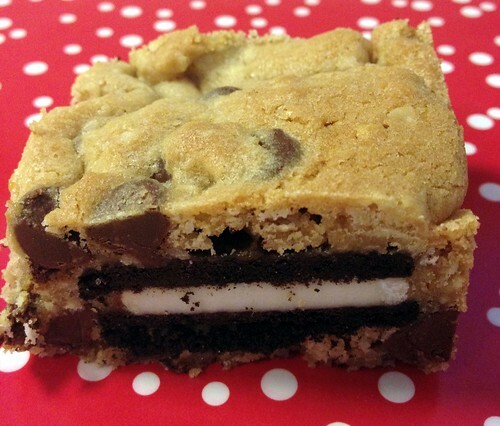 Picture it–a chocolate chip cookie topped with Double Stuf Oreos, then a layer of caramel, then finally topped with even more chocolate chip cookie. Insanity. And a huge hit with my coworkers. These cookies were gone well before the end of the day, and there is photographic evidence of everyone’s caloric intake floating around Instagram and Twitter. They’re crazy sweet, but a fun treat that people will definitely enjoy! Thanks Recipe Girl! Preheat oven to 350 degrees F. Spray a 9×13-inch pan with nonstick spray. Prepare the cookie dough: Place the butter and sugars in a large bowl. Beat with an electric mixer until smooth and creamy. Add the egg, egg yolk and vanilla. Beat well. Whisk together the flour, oats, baking powder, baking soda and salt in a medium bowl. Add to the butter mixture. Beat until everything is well incorporated, scraping down the sides of the bowl as needed. Stir in the chocolate chips. Set the Oreos on top of the dough in four rows of 6. Drizzle caramel on top–about 1 cup–over and around the Oreos. Spoon small dollops of the remaining cookie dough on top. Don’t worry if the dollops don’t completely cover the Oreos/caramel. The cookie dough will spread out as you bake it. Bake until lightly browned, 20 to 25 minutes. Cool completely (I put the pan in the fridge), then cut into 32 bars. This looks awesome. I will have to try it (though unfortunately with some other sandwich cookie). It completely fills the giant cookie niche too. Caramel and oreo stuffed into a cookie bar? Love!